“Connected Parent Empowered Child” by Leeza Carlone Steindorf provides tools for parents to help develop a positive, more rewarding home environment. Given all the stressors families have on a daily basis who wouldn’t want a more pleasant, less conflicted home environment? Throughout the book, the author provides family activities to increase communication and cohesion. She also provides CORE success activities that help determine how one handles stress, over-commitment, and other issues we all face. Emphasis is that the whole family has to make a commitment to this program for it to work. There are no parenting tools that are 100% correct since each individual is unique, so one must be able to utilize as much information they can get that will help the family. The activities included in the book need to be geared to each person understanding, especially when incorporating them with children. In order to help, parents must understand their beliefs and how they would like to see the family operated. This means taking a step back for some and having some good old self-reflection. After this, one needs to explore all options on what changes need to happen and how to incorporate them. This is not a speedy endeavor. I found it easier to first skim through the book to get a general idea of the topics addressed, and activities involved, and then read the book again slowly making notes on themes or ideas that caught my attention. The book is very well written with detailed information and examples. Again, it is a slow read due to the nature of the information. One question that did arise is how do both parents read this information? Do they share the book and discuss it first before implementing? What if both parents don’t agree, and there are issues? Change begins with one person so possibly one parent can make changes and the family will follow. The author is very upbeat and positive when providing information. One of the areas of concern is the time commitment. Often we start out with good intentions but then get sidetracked. One way to combat this is to hold weekly family meetings where topics, concerns, and open communication happen. 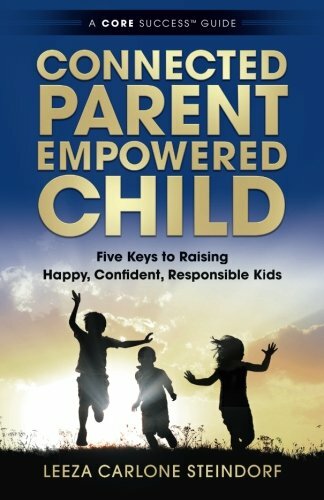 Overall, “Connected Parent Empowered Child” by Leeza Carlone Steindorf provides excellent information and certainly something to be considered by anyone in search of tools to provide a more positive and rewarding home environment.